iOS has a built in speech engine that allows users to select any text and have it spoken to you. This means you can have an iPhone, iPad, or iPod touch read the content of any web page, notes, text files, or even eBooks and iBooks. Before you can use the text to speech function, you have to enable it. Select the text you wish to have read, then tap 'Speak.' The iPad will then read the selection. Once dictation has started, the 'Speak' button turns to 'Pause', making it easy to stop and resume any spoken text. To use the 'Define' function and get a definition of a word, touch the desired word and tap on 'SELECT'. Once the word is selected, an extended bar of options will appear. Tapping the 'Define' option will give you the definition of the word as seen in the image. 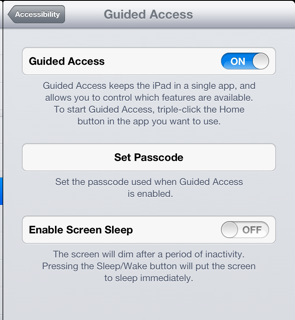 'Guided Access' allows you to keep the iPad in a single app as well as restrict or blockout certain features to users. To turn 'Guided Access' on, go to General Settings>General>Accessibilty>Guided Access> slide the button to 'On'. Watch the video below on how to setup and use!